Androgenetic Alopecia is also known as male-pattern hair loss (MPHL) in men and female-pattern hair loss (FPHL) in women. 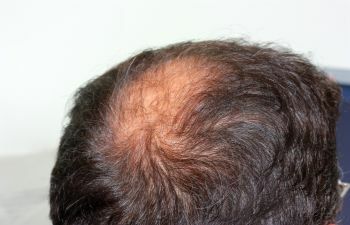 For men, it mostly affects the top and front of the scalp creating a “Hippocratic wreath.” The rim of the hair at the sides and rear of the head usually remain. The thinning and loss is usually gradual and can be a result of DHT that shrinks hair follicles. For females with FPHL, there is a gradual thinning of the hair around the crown. Women usually retain their frontal hairline. Temporal recession can occur, but this is much less common for women than men. For women, FPHL can be caused by a variety of reasons and factors usually linked to hormones. Diagnosis of androgenic alopecia looks different for men and women. For men, it can typically be established based on clinical presentation. For women, a diagnosis typically requires a more complex diagnostic evaluation. If you suffer from androgenic alopecia, you may be experiencing a level fear of what is to come, or a level of sadness for what has been lost already. Sanaz Harirchian knows that these feelings are real and will make every effort to treat your androgenic alopecia with great care and concern. Sanaz Harirchian, M.D. Facial Plastic Surgery is ready to help you with your hair loss issues. Dr. Harirchian is a board certified plastic surgeon that treats hair loss in both men and women. She uses PRP injections for quick and pain free as possible results. Contact her office today.